MINI has launched a special edition 1499 GT version of the hatchback, inspired by the classic 1275 GT. The 1499 GT is the latest special edition to be launched by MINI, with a nod to one of the best known sporty classic Mini, the 1275 GT - introduced in 1969. Only 1499 models are being produced from November 2017 to February 2018, exclusively to the UK market. The MINI 1499 GT is available to order now, with prices starting at £16,900. As the name suggest, the MINI 1499 GT will come with a 1.5-litre twin-turbo three-cylinder engine, offering 102PS. The car will be offered in two colours, Pepper White or Midnight Black, with 1499 GT side stripes. Exterior features include the MINI John Cooper Works Sport Pack, featuring 17-inch black alloy wheels and tinted windows. 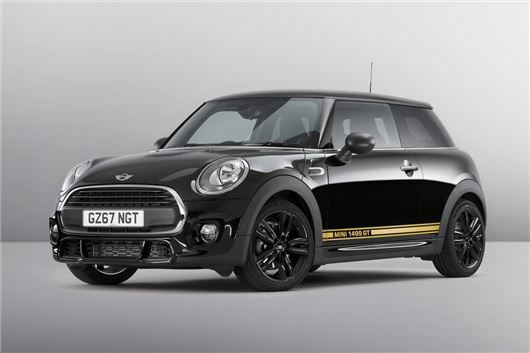 The styling pack includes JCW front and rear bumpers, side skirts and a split level spoiler. The John Cooper Works Sports Pack continues inside, with JCW seats and leather badges, as well as a leather JCW steering wheel and multi-function controls, cruise control and MINI Connected smartphone compatibility. Sports suspension completes the MINI 1499 GT package, which includes features such as independent rear suspension, a six-speed manual gearbox, air conditioning and all-round disc brakes. 1499cc is 136hp. Mini One 1.2 is 102hp. My bad! Just read Autocar, engine is 1499 but detuned to the same output as the 1.2 which has been discontinued.